Methylxanthines represent a unique class of drugs for the treatment of asthma. 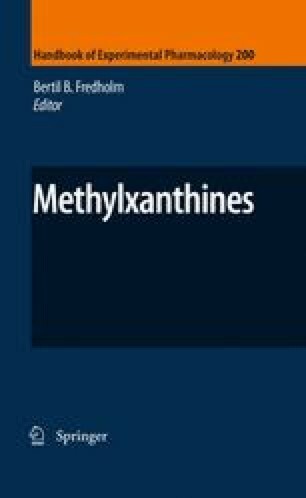 The methylxanthine theophylline has demonstrated efficacy in attenuating the three cardinal features of asthma – reversible airflow obstruction, airway hyperresponsiveness, and airway inflammation. At doses achieving relatively high serum levels in which toxic side effects are sometimes observed, direct bronchodilatory effects of theophylline are recognized. At lower serum concentrations, theophylline is a weak bronchodilator but retains its capacity as an immunomodulator, anti-inflammatory, and bronchoprotective drug. Intense investigation into the molecular mechanisms of action of theophylline has identified several different points of action. Phosphodiesterase inhibition and adenosine receptor antagonism have both been implicated in promoting airway smooth muscle relaxation and bronchodilation. Similar mechanisms of action may explain the inhibitory effects of theophylline on immune cells. At lower concentrations that fail to inhibit phosphodiesterase, effects on histone deacetylase activity are believed to contribute to the immunomodulatory actions of theophylline. Since anti-inflammatory and immunomodulatory effects of methylxanthines are realized at lower serum concentrations than are required for bronchodilation, theophylline’s predominant role in asthma treatment is as a controller medication for chronic, persistent disease.